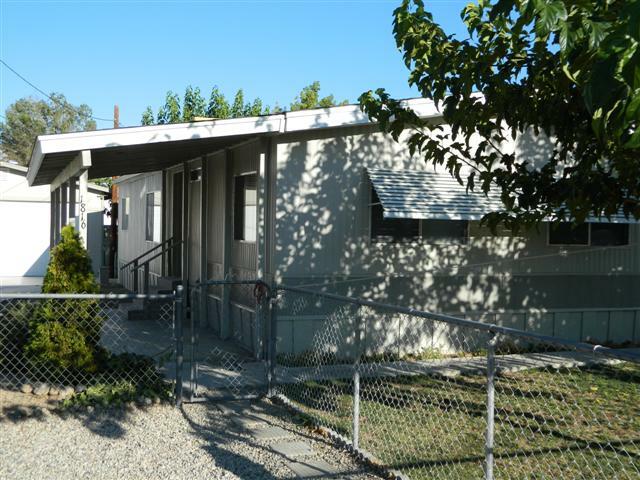 Lots of thought and care has gone into this beautifully maintained manufactured home. 3 bedrooms, 2 full baths, updated kitchen and bathrooms. An oversized two car garage with lots of storage space, a separate workshop, a storage shed on concrete pad and 2 covered patios make this a great place to enjoy life. RV parking area, completely fenced yard and automatic sprinklers for lawn and trees. Plenty of parking for vehicles, toys and guests! New pressure tank in 2011, new submersible pump and wiring in 2012. 2 year old comp roof on house, 1 year old ducted cooler. Propane wall heater added in living room, also has propane forced air heat. Newer roof on garage. Newer exterior paint. The Dixon Lane neighborhood is located on the North end of Bishop California. This is a neighborhood with lots of surface streets and cul de sacs, perfect for riding bikes and walking. The canal is right around the corner and has great fishing. There is a community water association that provides water and the Eastern Sierra Community Services District provides sewer connections to each property. This neighborhood is sought after by families and outdoor enthusiast. The prices range from $200,000 to $300,000 and the sizes of the homes are between 1,200 and 1,700 square feet.